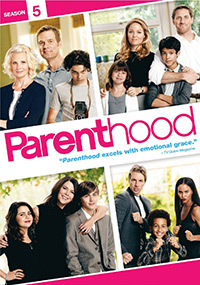 Reunite with the witty and wonderful Bravermans for a season of big plans and small kindnesses in the riveting fifth season of Parenthood. As Kristina and Adam reevaluate their lives after her fight against cancer, Sarah finds a career she loves and a possible new romance. Crosby and Jasmine adapt to life as a family with an infant in the house, while Camille and Zeek decide what their “Act 3” is going to be now that they have an empty nest. And though most challenges bring the relations closer together, Joel and Julia find their marriage crumbling apart in ways they never expected. Be there for all 22 exciting episodes of the critically acclaimed series that celebrates the moments that matter most presented uninterrupted and back-to-back!